The rainwater collected by self-irrigated-rhubarb ensures self-preservation of this rare desert-rhubarb. This self-watering-rhubarb takes good care of itself in the deserts of Israel and Jordan, and of all the desert plants or any other plant in the world, this appears to be the only one able to do this. 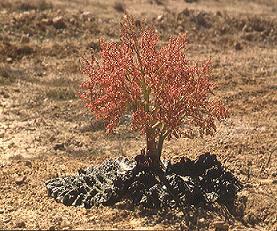 Rain is very scarce in the mountainous region of the Negev Desert, and the desert-rhubarb (rheum palaestinum) collects at least fifteen times more water than other plants in the same area. It also irrigates the soil around it much deeper too. The reason this self-irrigating-rhubarb can accomplish this? It's because of the extremely large rosette style leaves. The leaves have very deep indentations that hold the rainwater that work to guide the trapped moisture down the veins of the leaf directly to the base of the plant. These leaves, which are attached right at ground level, are waxy. This helps the water to glide swiftly over the leaf but not be absorbed into the leaf. These self-watering-rhubarb plants can collect anywhere from 4 liters of water to over 40 liters of water ranging in size from the smallest of plants to the largest of the self-irrigated-rhubarb. This is quite amazing, considering that it hardly rains at all in this area. But when it does, the desert-rhubarb doesn't miss a single drop of it, and the water is steered directly to the root system. Because of the way this system happens, a kind of mediterranean type climate is created around the plant itself. Notice those indentations, and how low to the ground and spread out these giant leaves are. This type of rhubarb that waters itself, is a truly amazing find in a place normally so dry. It does a wonderfully marvellous job at self preservation.